Murray is one of the Amerasian kids their G.I. fathers left behind when these service men were stationed in the Philippines. Murray now lives in an isolated barrio with his mother whom he calls Inang. one of his deepest desires was to own a pair of shoes that he could proudly show off to his playmates. on his twelfth birthday, Inang takes him to the city for the first time and Murray was amazed at all the wonders he saw. he was also curious about the contents of a box that his Inang held close to her side. despite his questions, his Inang refused to tell him what it was. this short story was written in Filipino, the official language of the Philippines. if Arch Bala's intention was to shock his readers, he succeeded in doing so. if his plan was to show a glimpse of poverty and desperation and what their repercussions could lead to, he achieved his goal. 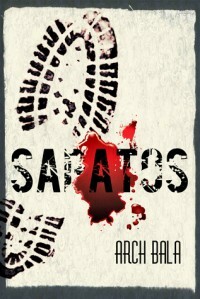 "Sapatos" or shoes was not at all what i expected it to be. the last couple of paragraphs made my eyes bulge. like Murray, i was very eager to know what the box contained and the event surrounding that disclosure shook me to the core. this was a disturbing read to say the least but i also understand in a twisted way how and why it could have happened. i just felt bad and sorry for Murray whose only desire was to have a comfortable pair of shoes.